I get a few cooking magazines sent to me every month. Three to be exact. Two of the three baffle me upon arrival in my mailbox. Every month I get my Bon Appetit and I ask myself what I was thinking when I ordered it. Its pages are filled with recipes for gracious outdoor parties and uber-cool dinner salons. The people in the photos are all beautiful and interesting-looking. The kitchens are showcases. The recipes presume a certain level of kitchen know-how and go from there. They also make assumptions about your gear. Naturally the kind of urban sophisticate who throws Tuscan dinner parties on her inlaid-brick patio have all the right equipment. Me? I have what could pass as a patio, but I don't have a George Foreman grill. I don't have a pasta maker. And while I think I may have a lemon zester, I have never actually used it for its intended purpose, which, come to think of it, I'm not really clear on anyway. It did nicely scrape residual tape off my landlord's wood floors recently, though. One day I may have the skill to attempt a recipe within the pages of Bon Appetit, but not this week. In fact, likely not this decade. I get Gourmet also. I don't remember ever ordering it. Maybe I was sleepwalking? Maybe it's somebody's idea of a joke? Barbara Cleaver Tilsner nudging me from Beyond? Anyway. I flip through it and promptly toss it into the recycling bin. Why would somebody like me even attempt a recipe found in such a magazine? Even the weight of the paper stock intimidates me. The one cooking title I subscribe to with delight, however, is Everyday Food, a clever, paperback sized magazine that features the kinds of recipes people like me might actually try, and even better, might actually have some success at. Yes, it is published by Martha Stewart Living, but obviously they've found a new, lower-caste niche audience and are exploiting it to great profit. Over the cover title a banner reads: Your Guide to Fast, Great Meals. I like fast. And I like great. Wouldn't it be great if I could actually make great, fast meals for my family? The book excites me because it makes cooking well seem so accessible. The recipes are all broken down into simple steps. They even include a shopping list so you can actually have all the ingredients onhand before you start (a common misstep of mine). It has features aimed squarely at me and my ilk. "Food Facts" is one page all about a commonly-used foodstuff - honey, for example, or wine, or tomatoes. It has a page about spices, a page about basic kitchen items you might find helpful, like a chef's knife, or a cheese grater. There are recipes on basic sauces, so you never have to guess about how much garlic to use in your vinaigrette ever again. I flip through the pages and feel my sap rising. Zucchini frittata. Asian chicken and chili soup. Potato leek soup. Gingered carrot salad. I dog ear many pages. I use Post-It notes without restraint. I almost paw the pages. The photos are simple, uncluttered. Inviting. I might be able to make some of this, I think. I'm not normally prone to deluding myself. As of my most recent birthday, I'm afraid my dreams of being discovered to star in a Broadway musical are long behind me. I will never grow into my looks. My skin will never clear up. I accept all of that and more. And yet, when it comes to cooking, hope springs eternal. I feel that desire to cook well should supercede utter lack of ability and talent. And so I forget past embarrassements and forge ahead. I forget about the meatball soup debacle, for example. That's a recipe from Everyday Food. And it's for the best that I've blocked out what I did when trying to create the white bean chili featured in the "Cooking for One" section. You just don't want to know. Some things can not be written about. And so it was with this particular dementia that I flipped through my latest issue of Everyday Cooking and set my eyes upon a recipe my entire family would enjoy (switch on copywriting tone). Tortellini with peas. 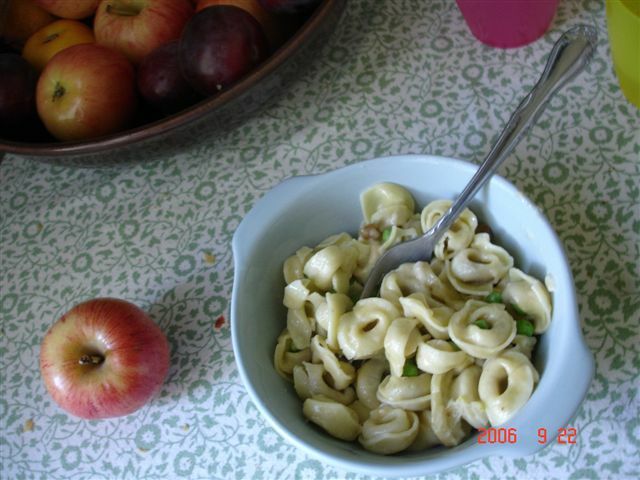 My kids like tortellini. They like peas. They like garlic and they like Parmesan cheese (especially when they don't know it's there). I also like all of the above. If I could make this dish I might successfully add to my daily evening repetoire, which these days seems to consist mostly of plain pasta, breakfast cereal, Dino Nuggets and edamame beans. Tonight I tried it. Although maybe I should have waited until a day that was not Friday, as well as a day that we didn't have a play-date over. Also, it's hard to concentrate when your kitchen iPod is competing with your six-year-old's Godzilla movie in the next room. But when have I ever let chaos stop me from cooking? Cook the pasta about two minutes less than it says to on the package, then throw in the peas. Cook on until the pasta is al dente and the peas are tender, two minutes more. Drain the pasta and peas, but reserve 1 cup of the pasta water. Dump your pasta and peas, the Parmesan cheese and most of the reserved pasta water, back into your pot with your butter sauce. Mix it all together. Add salt and pepper. Add more water if necessary. Top with additional Parmesan if desired. Couldn't be simpler, right? Here's where I fouled up. The timer dinged just as I was yelling at the kids to stop playing with their light sabers in the house and I drained the pasta even as I realized that A) I forgot to put the peas in and B) I forgot to reserve the 1 cup of water. So I dumped the steaming, not-quite-drained pasta back into the pot, poured the butter sauce onto it, dumped the Parmesan in (I had grated, not shredded) WITH the frozen peas and mixed it all together really quickly, hoping the friction would help cook the peas. I forgot all about the course salt and pepper. It didn't look so bad, though. The cheese melted nicely. The peas cooked through. I put some in a bowl even as my children and their friend were rolling pillows and other objects down the stairs, and I gathered up my library book on the Alhambra in Spain, and I sat down at my Ingo table in the kitchen and I ate my tortellini and peas in relative peace and quiet, all the while reading about why things were always better in Andalucia, even 1,000 years ago. And I had a small epiphany of my own. My kids would sit and eat this dish. When they got hungry enough. Also this: I don't like peas.